The final day of March saw much cooler weather than of late, but volunteers were not deterred by this. Passenger numbers were modest but were boosted by a coach party who did a single journey between Wirksworth and Duffield. Maybe the supposed fuel shortage had something to do with it? Indeed there was more pumping under the Class 119 for the DMU team than there was at most of the forecourts in Derby today as they continued with the rebuild of this vehicle. The fuel pipes which connect Engine No.2 to the main fuel tank were connected up and after much pumping all of the air was eventually removed from the system. It is disappointing that a ceremonial starting of the engine couldn't be achieved due to a distinct lack of electrons from the old battery cells, but good progress all the same. On the theme of pumping, the 8F group began to pressure test the boiler of Henry Ellison with water so lots of pumping was going on in that vicinity too. The LMSCA were in attendance working on the new floor for the Brake Third coach and work continued on the LMS Brake Van as well. However, the biggest news of the day is that the new Pullman Buffet flung open it's doors for the first time to mark the start of 7 day a week opening. Many bacon butties were sold and many compliments were received. The new facilities will allow the catering operation to grow with more 'exotic' dishes promised very shortly. Bring on the cheesy nachos! Another first was the ceremonial opening of a new temporary Duffield 'Booking Hall' which served as much needed relief for the Ticket Inspector. The Passenger Department spent the day replacing most of the signage around Wirksworth Station to assist visitors in finding our various offerings, including the Pullman Buffet. The day started with the Multicar setting off with Richard P and Tony W to start our weed treatment season. Because of the excitements of the Duffield opening last year we never really got on top of this essential area of activity but there is a determination to ensure 2012 will be weed free. A rather earlier start by Neil ensured No3 was ready to roll at 1000 to cater for today's steam experience clients who thoroughly enjoyed their day in the care of Neil Hardwick, Mick Thomas and Tom Tait. After lunch they participated in No3's journey to Shottle and returned in fine style with a short freight train. The participants from Kuala Lumpur, Mansfield and Bombardier Derby expressed great satisfaction with their day with us. Angela ensured the inner man was fed at lunchtime.Tremendous good will from people who had little knowledge of our existence beforehand. Much praise and thanks to the Lone Carriage Cleaner, Jacqueline Ferguson-Lee, Joe Ruddock and the dmu team who achieved a great deal to assist John and Angela to ensure the Pullman Buffet Car can trade tomorrow and thereafter for seven days a week. A photo is attached that reveals the LCC and the new look Buffet Car. The First Open is now complete and, all being well, will join the Second Open next Tuesday representing the culmination of this project that has occupied the winter months. John will return in a couple of weeks to line out the three vehicles and apply the branding that we wish to trade on. The Class 119 presented Leigh and Ben with some challenges that were overcome and Anton masterminded the bijou Duffield Booking Office being ready for business tomorrow, indeed he is still at it as I write. As an honorary Booking Clerk for a period today I managed to hoover out a few more pounds from our experience customers and a group of four who had last visited us in 2003. They noticed a few changes in the intervening years! I do have to wax lyrical again about the Buffet Car which demonstrated the best traditions of our Railway where representatives of many "departments" pulled together to get the job done. There is a little more to do next week but we should be all singing and dancing by the Easter weekend. The First Open benefited from another fine day and its release from the painting exercise is planned for next week. A tremendous achievement by John Allsop and a great credit to him for working in all weather conditions to complete this worthwhile project. John Birkinshaw and helpers approached the end of the Buffet Car reconfiguration that will transform what we can offer there. This vehicle will recommence trading this weekend and will be fine tuned ready for the Easter holidays. I think everyone will be quite taken by this transformation. The VCT returned to the east side of the line north of Shottle and had a four fire day with six of the team being in attendance. This area of solid blackthorn is back breaking work requiring fence restoration after the mast of foliage has been tackled. Each time our passengers go down the line the compliments flow for all this endeavour. The dmu team performed very useful maintenance work as a speedometer was replaced on one vehicle and the vacuum exhaust valve on another. We forget that all these vehicles are over 50 years old and need tlc to maintain their amazing availability and reliability. The first delivery of recovered seats for 51505 were the first class squabs which look absolutely marvellous and lift this vehicle to new heights of luxury. The LMSCA inched forward with the welding of floor supports as the BTO project progresses. I can't wait for the return of an operational LMS Stanier coach after all the misery of the fire. A tinge of sadness as the Railvac departed together with its supporting workshop container whilst marvelling again at the skills of Allelys and their team. The Booking Hall further revised the web site with our additional train section and dealt with an inordinate number of phone calls, most of which were productive in some way or another. Another most pleasant day that gave a sense of wellbeing and glad to be alive to speed us along various achievements.The PWT encompassed a range of projects that caused two wagons of logs and some garden quality sleepers to be delivered to Wirksworth together with the three Dogfish which will be loaded with the surplus ballast from the Railvac demonstrations. The Buffet Car had a doors and drawers day as the units come together without the benefit of any instructions sheets testing the initiative of John and David W. The First Open had its final coat of cream gloss on the west side and, with the assistance of Will, the application of black gloss to the bogies and underframe equipment. There was welding undertaken on the LMSCA BTO which I earnestly hope will be without further incident. The DTT was reconstituted today with David N being assisted by Vince Morris and Rodney to complete work on the plinth that will allow the erection of the temporary Booking Office on Friday. Leigh was put through his paces today handling the ever growing number of group bookings and enhancing the web site in two ways. The first is to put our weekday catering vacancies on line with a brief description of the working hours and duties. The second was to create a new segment in the timetable section that shows additional public opportunities when we run additional services for groups that will, hopefully, lead to top up passengers anxious to travel on "non operating" days. Some 40 people on our Railway today were undertaking a vast range of jobs. Bob Swepstone had another mentoring session with the track patrol and propelled his track recording device on the Wirksworth to Idridgehay section which will reveal whether there are minor or major track faults. The PWT completed the project to plain line the pointwork north of the former Dust Dock and also extended Road 2 northwards towards Rowsley. Rearrangement of the trolleys and their sleepers in that area will allow the water tank wagon to be berthed there and eventually connected to the overflow of the static tank at the base of the Incline as we seek to streamline the delivery of water to our steam engines. A major shunt took place to fill the water tank on the Incline, move the First Open to a position where its painting can be finalised and place the Stanier BTO adjacent to the Weighbridge for further welding. The shunt also prepared tomorrow's works train read for a prompt departure. Much progress with the Buffet Car today as the counter began to take shape, Joe attacked the grimy windows on the east side and the Lone Carriage Cleaner gave the former guards area a clean removing some thirty years of accumulated dirt. Then LCC also gave the two car dmu used over the weekend a makeover. Much progress was also made with the renovation of the Bubble Car. 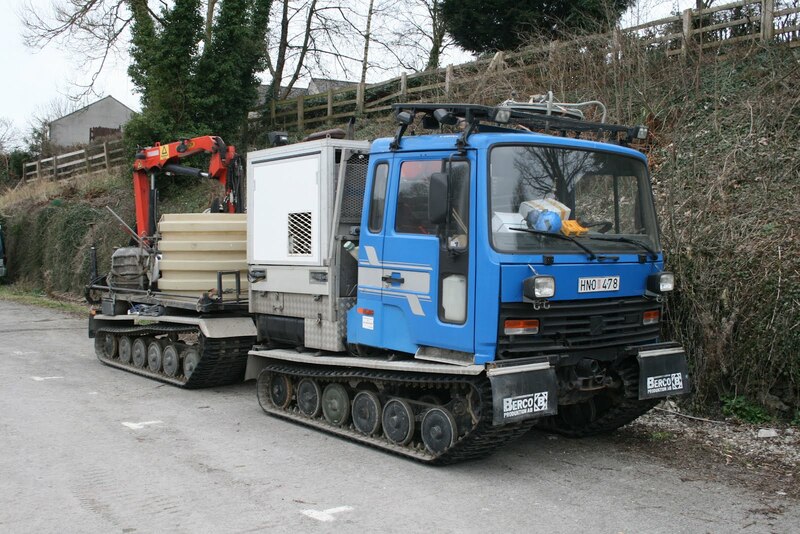 The Multicar was readied for the start of the weed treatment season and Richard P walked around the Wirksworth site with a hand held treatment system. In addition to the movement of their vehicle the LMSCA continued with the floor of the BTO and welding of fixing brackets for the floor. The VCT dealt with two areas, one in the morning that saw two fires in the area of Bridge DJW6 and in the afternoon a further two fires in the area of Milepost 133 3/4. Their day was also orientated around the Duchess of Sutherland passing through Duffield - twice. The DTT which has now been reduced to a team of one spent the day curing leaks and completing the final electrical installation. There was a mite of assistance with a kango hammer to shape the concrete plinth to allow easy access to the Ladies toilet. The footpath along the former Down Slow Platform was weed treated. The Filing Fairy is getting ever more assertive as she homes in on missing paperwork - wonderful stuff! The DST made progress on their steam ventures and the Booking Hall brought the accounts up to date and reported on yet more group booking activity. assisted by ASM Woodhouse and Sutton on Hill Fitters and Painters. platform upon which I was stood to show it to me in my very own person. A beautiful warm and sunny day saw excellent passenger numbers for March, including an army of 16 bicycles. Mechanical examinations were performed on 50170 and the centre car to allow those vehicles to run in the coming season, further cleaning in 51505 was achieved and work began on reinstating removed areas of the cab on the bubble car. The LMSCA continued to install the floor into the Brake Third coach and the 8F group were in attendance. Some final testing was undertaken this morning by the Swedes. A Friday with an unusual amount of activity as our customer wound down their operation with contractors tidying up and levelling the base of the Incline and dealing with fencing in the area of the culvert demonstration. The Railvac received maintenance after its many tasks so as to be ready for work on the National Network before departure on Monday after some further testing tomorrow morning. The First Open is now complete on the east side and will be moved over in the Maintenance Facility next Tuesday so that the west side can be finished. Further work on the Buffet Car worktops was progressed and there was great activity to deliver a two car dmu unit for the weekend's services. It was nice to welcome a couple from the Keith & Dufftown Railway, The Whisky Line, (a most popular railway with me as you might imagine) who had dropped in to see what we were up to. They struggle for volunteers and cope with their enterprise with less than 40 volunteers which must represent quite a challenge for 11 miles of railway. The Booking Hall prepared for the weekend in the morning and then joined up with Eric Boultbee who had persuaded some representatives of East Midlands Trains to see what may be done to improve the footpath link between our two enterprises. We await the outcome with interest. A slightly sour discovery when the Class 119 dmu car was found to have some rather childish remarks written on the bodywork in the style of those seen on an unwashed white van to the effect that said "scrap me". I feel that this was probably someone internal to our organisation who is insensitive to the effect on the morale of our most dedicated team who look after our dmu fleet. An invitation to join another organisation will be issued if the culprit is discovered. Sadly, our energetic client drew their demonstration days to a conclusion with many attendees who enjoyed the best of Wirksworth days as the sun shine warmed the sea of orange. Angela and her extended family delivered a worthy buffet lunch with Mick and Bob gently guiding the client to deliver demonstrations that were useful to us. Everyone seemed content with the arrangements. The PWT wrestled with the plain line section that will replace P5 (point) at Wirksworth leaving a little finishing off for next Tuesday. The VCT returned to the area a little north of "willow" crossing and completed fence repairs on the Up side. They restored the fence on the Down side after yesterday's culvert lining activity but restoration of the Up side will require more thought. A strong, I only use this expression to describe the size of the team, dmu group gave 50599 an "A" exam and restored the dome to the south end of the Bubble Car which also received more sanding down as the time for painting approaches. In order not to conflict with the vital work on the First Open, and avoid the risk of conflict between the carriage painters, the Bubble Car was drawn outside given that no rain has been forecast until next Tuesday.Cream top coat has been applied to the First Open and the east side bogies and underframe have been painted. The south end sole bar has been equally treated and the first application of colour to the pipework. The Buffet Car project had more work tops fitted but it is clear that we have been over ambitious with the opening day which will now be Friday 30th March - without fail! A young offender and minder cleansed Platform 1 including the elusive area around the flag pole and the Booking Hall continued to process group bookings and deal with the usual range of phone calls. Great news from Duffield from the DTT who reported that decoration of the Ladies compartment is complete and self levelling screed has been applied to all floors ready to receive floor tiles. As ever the Duffield toilet project and the Buffet Car modifications are quite major developments for us and entirely dependent on the energy and good will of those that are doing the work. I am certain both projects will be well appreciated by their clients when they are complete. Some of you may have noticed the large yellow machine in the loading point at Wirksworth when watching the webcams. This machine is on test with us and is designed for moving earth and debris very quickly. It is called a Railvac. We have uploaded photographs of a customer demonstration day that was held yesterday on the railway where the machine was shown to prospective customers of the machine. The photographs can be viewed on our Facebook page. Don't forget, if you are a Facebook user, please "like" our page for regular up-to-date information and photographs! The main event again today were the activities surrounding our customer which, for one day only, divided into two parts. Iris was mustered to take quests to an area near Hazelwood to see a new culvert lining process. This involved Graham W, Tom T, Richard B and Bob S who ensured the guests were safely looked after as they viewed the work being undertaken. At Wirksworth the Railvac was demonstrated to a new audience under the watchful eye of Mick Thomas who also manned the Komatsu that moved new ballast to fill the voids created by the Railvac. Angela masterminded the lunch time buffet which was delivered in less than ideal conditions as the Buffet Car fit out continued. The Iris team returned to the culvert site for a post "curing" visit and I thank all our team for making the customer and their guests so welcome. The Lone Carriage Cleaner agreed designs for Pullman curtains to fit the Pullman Buffet Car and gave the three car set a good clean for the weekend. The Buffet Car now has sinks as this major project draws to conclusion. The PWT concentrated on the point north of the former Dust Dock, P5, and removed the point and crossing work so that this can be a "plain" line allowing the "LMSCA siding" to end a little short of their workshop. The Filing Fairy has doggedly pursued the completion of our key paperwork. I honestly don't know where we would be without her input as it is often like platting fog to complete the whole picture for each of our key operating staff. We know where we want to be so don't be inhibited by this very necessary part of our new world. The DST hosted the boiler inspector who, thankfully, signed off the loco for another season of operation. I do thank the team for going that extra mile to ensure our first steam experience customers next week will not be disappointed. Further progress with the First Open saw the east side cream applied and I don't envy John who dealt with the aged debris of the toilet end of the coach and treated it with anti corrosion paint. Great news from Duffield as the DTT achieved a triple flush today in addition to further plumbing and electrical progress that was not without its moments that I am sure will be revealed in the fullness of time. The Booking Hall acted as a signpost for all the visitors to our site and achieved yet more group bookings boding well for the 2012 season. 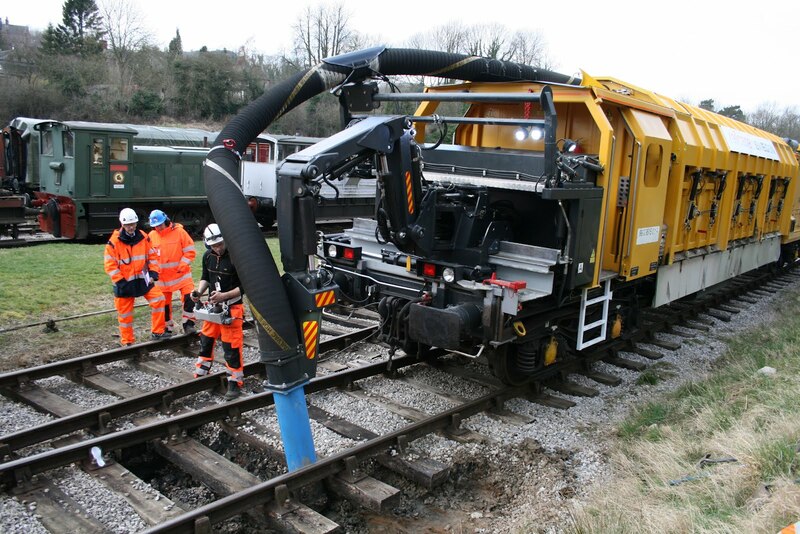 The main act of the day was the first demonstration event for the Railvac which was centred around the base of the Incline. The machine delved deep into the clay base with great effect and this was followed up by the installation of a membrane. Our very own Komatsu delivered replacement granite ballast and a gang of contractors packed the void with the age old technique of shovels. 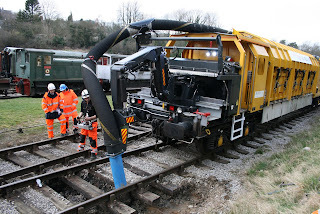 The Railvac then demonstrated its ability to create an under track drain and catch pit to the wonderment of the gathered guests and potential customers. Angela tested some of our new team of weekday catering personnel preparing a buffet for our customer and their customers. This all passed muster very well and was a precursor to the next couple of days. The VCT were out in force just north of "willow crossing" and had a three fire day together with repairing some 300 yards of fencing. Their continued endeavour remains a vital part of our long term wellbeing. The DTT reported further plumbing installation, decorating and fixing but recognised that their goal of the first flush still eludes them. The flat pack Duffield Booking Office arrived a day early and was loaded into Saturdays service train for delivery to site. The wiring associated with our new webcam installation was tidied up now that the system has proved itself to an appreciative audience. The PWT went fairly quietly about their business changing some 23 sleepers between Callow Park and Derby Road No2 bridges together with a couple of broken base plates. The Buffet Car project was in full production as the weekend deadline approaches. Much progress was made with the First Open in the unseasonably pleasant weather with cream undercoat applied to the east side and "madder" undercoat completed on the west side. In parallel the Bubble Car guards door frame made progress with an unique steam timber bending device. The LMSCA installed another floor panel in the Brake Third Open with five out of sixteen now achieved. The DST managed to weave in amongst our customer's activities the reuniting of No3's water tank with its host locomotive. Much effort was spent to reconnect everything ready for a steam test tomorrow. Fred and Iris gave the Mess Hall a very welcome good do and the Booking Hall completed the accounting for the diesel weekend and welcomed a welter of visitors. A fairly crazy day for a normally quiet Monday with our customer receiving quantities of equipment, ballast and pea shingle that will play their part in three days of demonstrations of the powers of the new machine. Mick and I confirmed what was required of us for the rest of the week and I am sure all that is demanded of us will be delivered. It was very warming to see some 150 tonnes of Mountsorrel's finest ballast being delivered by La Farge and various diggers and JCBs. A photo is attached of the Railvac hovering up some 18 tonnes of pea shingle also included in today's deliveries. 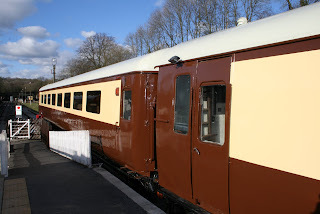 Other equally exciting work achieved was great progress with the First Open where the east side top coat of "fing umber orient" was applied to the east side gutter stripe and north and south doors. "madder" undercoat was applied to the lower body of the east and west side of the coach. The Buffet Car project inched forward with more work top and unit installation achieved. The Lone Carriage Cleaner put a great deal of effort into the Second Open that will be the centre of operations for our customer's catering over the next three days, washed a great number of pots and gave a further clean of part of the Buffet Car ceiling. The Komatsu was returned to Wirksworth and the road/rail dumper was also prepared for use over the next three days. The Booking Hall received a few visitors and phone calls that didn't interrupt life too much for its occupant allowing appreciation of today's offerings on Radio 3.
outer Anatolia and inner Buckinghamshire. extremely popular with the said enthusiasts. The day started with a great deal of angst! A large vehicle arrived from Sweden, which in itself was fine as it was expected, transporting two specialised vehicles for next week's demostrations which could drive off the trailer. Unannounced was a four tonne very large pallet requiring discharge which, after some head scratching, was lifted by two fork lift trucks whilst the trailer was driven from under it. Three cheers to the combined efforts of Joe Ruddock and our neighbour, Miltech. In amongst this mayhem the Pullman Buffet Car carpet and fitters arrived an hour earlier than planned and before the area to be carpeted had been cleared. However, everyone on site pitched in and matters were rescued so we now have a spendid red carpet in what will be the customer seating area. Our lone carriage cleaner set to move furniture stored in the Second Open to the newly carpeted area to prepare that coach for its starring role in customer functions next week. No wonder I have to hit the bottle! Preparations went on for the weekend with the cleaning of the Class 20 and formation of its first train tomorrow. Anton co-ordinated the many last minute jobs to ensure we will have a profitable weekend. The first customer pitched up this morning! A photo is attached of the Wirksworth snow mobiles delivered this morning. Our large yellow machine escorted by the de luxe Landrover headed off for Hazelwood and cleansed the culvert adjacent to the fishing club site in preparation for a demonstration of a new culvert lining system next week. They were looked after by Mick Thomas and disappeared quite quickly this afternoon to attend a football match in Manchester. We are only here to serve! The VCT gravitated towards Duffield and cleared vegetation around footpath F3 with two fires reported. This area of activity was determined by the movements of our customer and the desire to train spot at Duffield. Again they were thwarted by a failure of the Duchess at Derby and so it was determined that productivity again was not interrupted by enjoyment. A slightly frustrating day for the Buffet Car team as the sealant applied yesterday resisted drying in the inclement damp weather conditions and the water heater kindly donated for the project was declared at failure. The water supply to the coach was properly lagged and the electrical supply to a very generous supply of wall mounted heaters was installed. Joe also removed excess paint from the exterior windows of the vehicle. The dmu team were busy with a service for Iris and putting together the combinations ready for the upcoming diesel weekend. The First Open had its roof painting completed and the PWT achieved a further two panels of the Shottle loop ready for service. The DTT reported great strides with the plumbing and a start on the installation of the sanitary units. A first flush is very close to being achieved with many thanks to John, David and Maurice. It was very good to welcome Peter Taylor after a harrowing period of operations and complications. A delight to see him firing on all cylinders again. The Booking Hall continued the work of filling up our scheduled services and dealing with charter enquiries. Another rather special day of creative and productive activity. The First Open has had the roof completed in undercoat and much activity in the Pullman Buffet Car included the completion of the wiring and the first coat of sealant on the prepared floor. The team of three in the Buffet Car really moved this project forward and we have now had an offer of tasteful curtains and blinds to add that finishing touch. There was a most productive briefing of the track patrol teams by Bob Swepstone and he has followed the classroom work up by commencing to mentor members of our team. I think this approach is a significant development of how we develop and encourage the learning of new skills. The remaining members of the PWT returned to Shottle and the rails for the next two panels of the loop to be assembled are now in position. It was good to hear from the diligent DTT who have now completed the necessary tiling and are well on with grouting these tiles. The electrical system for the toilet block is complete and thoughts are turning to the installation of the sanitary ware. Chris from the Class 20 Association has spent a day cleaning the engine compartment of D8001 ready for its starring role this coming weekend. The Filing Fairy has also been in go mode as we get better and better at recording and noting the achievements of the volunteer team. Our customer had a day of preparation and examination of the big yellow machine prior to a venture out onto the line tomorrow and the Booking Hall continued to process on line bookings and deal with group and coach enquiries. PS - In view of the activity of our customer all PWT tomorrow should report to Shottle for loop work! 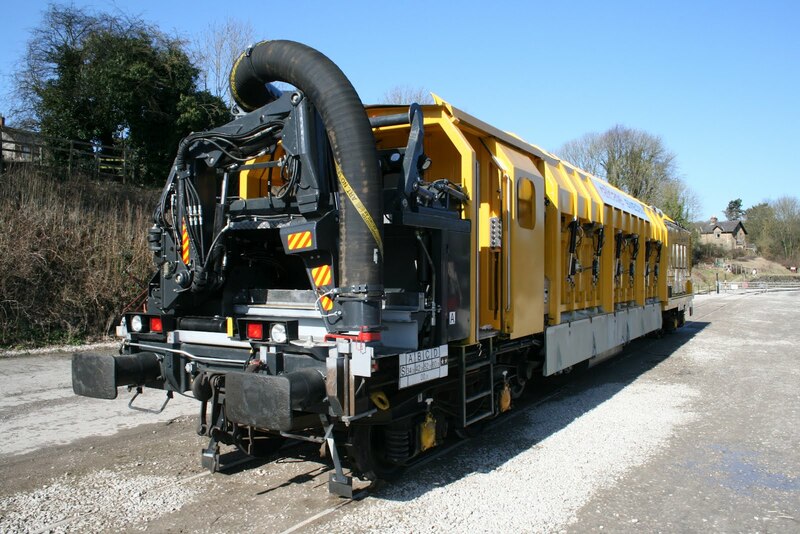 A most pleasant and, eventually, warm day with our large paying guest successfully satisfying the vehicle acceptance body that the Railvac is able to operate on Network Rail. They were most ably hosted by Mick Thomas for this key process and there were Swedish smiles all round. The Buffet Car project is moving into its final phase and John was assisted by Joe Ruddock in today's endeavours. For those of you who don't know Joe, he was one of the original eight that started the physical work on our project some 10+ years ago, put in a four figure sum to pump prime the pre-share issue and is recovering from a hernia operation at the age of 79. The VCT were somewhat thwarted from their planning trainspotting activities as the planned runs had been cancelled through Duffield. This caused them to return to the project between Old Lane bridge and Shottle with a four fire day and completion of the fence repairs in this area. Solid productive progress without the interruptions of enjoyment. The DST concentrated all efforts on bring No3 back to life and made encouraging noises that all was being done for our first steam experience client from Malaysia who would not be disappointed. The First Open has its roof prepared for painting, said in a few words that do not adequately reflect the effort involved. The PWT congregated at Shottle, in view of the unknowns with our test customer, achieving a splendid further two panels of the loop railed and spiked down. Stuart requested an assistant and I am pleased Tom Tait has accepted the challenge of being Assistant Operations Manager. Great things are happening to train and mentor new recruits which I hope will make their time enjoyable and rewarding when in our care. We had a pleasant charter with Iris today to celebrate an 80th birthday. My thanks to Chris B, John T and Richard B for hosting this event and a warm welcome to Peter Binks that shadowed the guard and third man as part of his guards training. Lots of appreciative comments for the service and attention given. Our significant customer was present to fully prepare the Railvac for its 1530 tests tomorrow and the Buffet Car project benefited from further unit fitting. The Booking Hall was shocked by an unusual amount of activity for a Monday but bravely dealt with a number of visitors and the phone, never quiet for a few minutes. PPS 1 I promised to see whether my pension would allow the purchase of June's favourite tipple - research at Sainsbury's indicated I would have to wait for next month's rise in State benefit. PPS 2 I don't think we have previously announced that Chris Beale will attend Board Meetings and will join the Board when he is available to act and comment on proceedings and represent the "large" locomotive owners. His words of wisdom will be most welcome. unless grey soles are a fashion item. force and no end of gardening was taking place on the embankment. the first stage of its conversion into the Station Workshop. platform at Idridgehay when a party of walkers turned up: "Train's here"
said one. "We love this railway," said another... "its always on time". Not a bad day in the Metropolitan Borough of Wasserville with the trains happily bobbing up and down, passengers numbers being a steady increase on last week. The interior of the new Pullman Buffet received a paint makeover and is now a tasteful cream to match the exterior. The internal refurbishment and cleaning of E51505 continued with the aid of two new recruits, Alex and Liam, joining us for their first day. Sanding took place on the bodyside of 55006 in preparation for the repaint. Other odd DMU maintenance jobs were also performed. Other locomotive maintenance was achieved on the Class 31 and Class 33 and the 8F group were in attendance. Time was spent at Idridgehay finishing off the umbrella platform. It has been quite a day for a Friday when all is usually calm and quiet. Robin who is in the lead with our contact at Birmingham University arranged for a radio signal strength test which produced a rather unimpressive result but will lead us to further options for resolution of a modern solution to passing trains at Shottle. All this is pioneering work that will take some time to work up to a practical and economic resolution of this addition to our infrastructure. The Class 33 team continued to ready the loco for its role in the diesel weekend and Rod & Mary fitted two new foot boards to the Pullman Second Open. This work is key to permitting our new Pullman set to travel the line in the future and I am most grateful for this contribution. Unsung and unemotional work like this really moves our project forward allowing for future revenue streams that will keep our enterprise alive. John Allsop has sanded and filled both side of the First Open and completed the first stage of work at the ends of the carriage. The Buffet Car saw June and a new recruit, Luke, clean and sand the walls for the painter arriving tomorrow whilst John connected both water and power to the kitchen area of the vehicle. All have done magnificent work as the deadline for completion rushes towards us. I have noted June's request for a reward with a certain brand made in Scotland and will see if my pension can extend to this desire. Fulsome praise for Chris and Leigh who have had some dramas with our new webcams that have largely been funded by some generous donations. As you will have seen these are now on line and will, hopefully, please our long distance enthusiasts. Some tweaking is still to be done but virtually everyone visiting Wirksworth is on camera now! I did have quite a glow as all the efforts to make the Training Room, by Chris, a plus for our mytesttrack offer saw today's customer with 4 laptops connected into our network. Quite a surprise for them as I think they thought we were somewhat of a hick outfit but their respect for us is rising quite quickly. The Booking Hall activity was somewhat diverted as attempts to stem the inflow of water to the Training Room were coupled to the application of filler to some of the more rotten areas of the interior of the Buffet Car. We forget that this vehicle started life in the 1950s and has survived various transformations in its 60 year life. It will now be a key earning area for our enterprise. A big thank you to all involved in today's activities. After a battle with connectors, we are pleased to announce that two further webcams are available to view online at http://www.e-v-r.com/webcams/. These have been purchased with the help of your generous donations so thank you to everybody who contributed. We hope you like them! We still have a little tweaking to do to get the optimum picture quality and colours which will be done in due course. If you are struggling to see new cameras in the menu to the left then I recommend that you clear your Temporary Internet Files/browser cache and try again. If you like what you see then please continue to donate as we would like to invest in further cameras - maybe at more exotic locations such as Duffield although this will require greater expenditure! Before I get flogged I have an ommision form today's report - the endeavours of the PWT who have been quietly working away at Shottle. A four man team have achieved an amazing 100 sleeper laid, with base plates, on the Shottle loop project. They have been correctly aligned and represent the base of four panels of track and benefitted from two aids, the Swepstone "acme" track alignment jig (with new improved string) aided by the Watt "universal" sleeper squaring and track spacing jig. I only write this stuff without necessarily understanding a word. We start today with the Buffet Car where a floor sander had been hired and achieved a splendid result which will allow sealing in the area between the counter and the new carpet that will be fitted next week. David W has provided assistance to the project by applying another form of sealant that will stop the chip board units being damaged by water. The other major project saw John S working on his own at Duffield reporting further tiling progress and the boxing in of pipework. The VCT have been out and about in the area south of Old lane bridge but I haven't been advised of the fire count. Much activity on the dmu front with the service unit given an exterior wash, Iris's air axle light fault has been remedied and the units fuelled for the weekend's services. The Bubble car moved into the phase of being sanded down and prepared for painting. The Booking Hall continued to process future bookings. I and other members of our team attended the memorial service for Fred Morton that was overwhelmed by quite a crowd indicating how respected he was in the many areas he was involved in. The location in Rowsley was quite appropriate as the graveyard was bounded by the trackbed of the former Midland main line and there were the ghosts of freights being banked northwards and perhaps the hum of the Midland Pullman as it whisked its lucky passengers by this charming spot. Also, it was good to see Mike Craft at Wirksworth Station after his quite invasive knee operation and less good news from Alex Thompson after Network Rail rejected his application to join the Company. Mick Thomas ably looked after our customer for their EMC testing day although we remain a little baffled about quite what they want from us. Perhaps there is a language problem but we remain ready to serve! There was a combined effort by the PWT and DTT to prepare and concrete the ramp to the "disabled" toilet at Duffield. After some considerable expenditure the plinth that used to support the mobile phone tower has been cut to allow for a footpath from Duffield platform to the Ladies toilet. It is also reported that a large amount of tiling was completed yesterday and I most grateful for all the effort put into this project. It is not glamorous but very essential to the long term future of our Railway. A small team at Shottle completed the preparation of the loop trackbed which will allow this project to move forward next week while our customer occupies the line. At Wirksworth the Bubble Car saw its last piece of weld applied. This has turned into a major rebuild project and we are fortunate to have Dan who has worked diligently to produce a vehicle that will be a great credit and very useful to our enterprise. However, he is in slight completion with John Allsop working on the adjacent track and today has sanded down the east side of the First Open. Hopefully they will be able to work in harmony until both projects are complete. 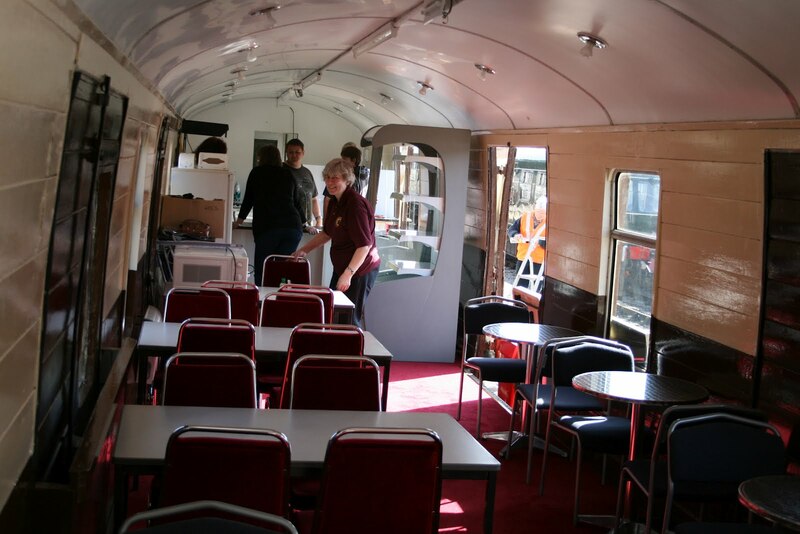 The Buffet Car has been the centre of attention today as the lone carriage cleaner extended her hours to clean the ceiling within the vehicle. This is quite a job and I recommended a hot bath this evening to relieve the aches and pains or copious product of Scotland. I did feel my homilies may have fallen on stony ground. Nonetheless, John assisted by Chris R today made further inroads to this mammoth task. The Head of Gardening seemed to in conversation with a member of the public about dog poo and the accompanying dog appeared to be quite small but didn't take kindly to my wish to pass the time of day. The Booking Hall dealt with the ever growing welter of phone calls and began the process of harmonising the catering prices between the Booking Hall and new Pullman Buffet Car. The Lone Carriage Cleaner is returning on Friday to prepare the interior paintwork for the arrival of a decorator on Saturday. If anyone would like to assist they would be made most welcome! Exhausted of Wirksworth by the sheer number of people that populated our site today. The LMSCA reported a further four floor panels have been fixed in 27001 and the Buffet Car project moved on at some speed as deadlines approach. Many thanks to David Woodhouse who has pitched in to help these deadlines be met. The DST have been assured that their work on No3 has been satisfactory and have started to put the locomotive back together but delivered the news that it may not achieve its first paid for steaming on 30th March which has made me somewhat liverish as one of our first guests is flying in from Malaysia. They also made further progress with Henry Ellison with work on the frame and the boiler. Nonetheless, these locos have to earn their keep rather than be charming museum exhibits! The PWT benefited from the most pleasant, if cool, weather today with a near record of 26 sleepers changed between Gorsey Bank and Idridgehay and straightened six sleepers that were poorly aligned. The Komatsu and supporting staff continued the grading of the track bed of the Shottle loop that involved the gathering of sugar stone, fairly large lumps of limestone, that had been deposited by a derailment in the last century, putting the product to good use as a base. 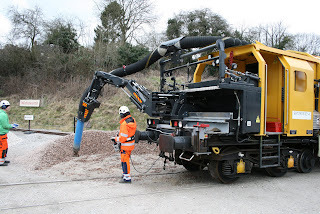 Our Railvac customer continued their assessment of the new build machine in the Car Park before tests start in ernest. The VCT achieved yet a new record with a six fire day in the area south of Old Lane bridge. You have to say they never cease to amaze! They also used concrete posts recovered some while ago to help restore the fence line in their area of work. A temporary Booking Office has been ordered for Duffield which will look strangely like a garden shed but in a tasteful shade of grey. The Booking Hall was in go mode with useful banking from the previous seven days and held a meeting of the Booking Hall team in preparation for the upcoming season. Several applications for the new catering positions have been received and Angela is arranging to meet and interview prospective employees. We have had quite a day with the arrival of Allelys rig to turn our two former Gatwick Express coaches. This involved some delicate work as these vehicles have a normal coupling at one end and a "bar" coupling at the other. Our objective was to have the Second Open at the south end so that it became the overflow from the Buffet Car and the First Open at the north end as a special area for groups and parties.After a great deal of effort by Graham, Tom T and Mick T this was achieved and you will a see a photo of the Second Open adjacent to the Buffet Car and they look great! This work entailed moving our guest machine from the car park and returning it later in the day. The webcam pictures illustrate the current situation and further investment by donors has enabled me to purchase a further two webcams that will amaze you. I have to say, as a grumpy old man, that this extension of the camera coverage has been highly dependent on one major donor and a small steam of other contributors whose input has been most welcome. Those of you who enjoy this feature who haven't appeared on our PayPal account should, perhaps, reconsider making a contribution to extend this view on our life. EVRA recovered a massive bequest of books and recovered most of them yesterday. They started to arrive at base today and will keep Pat and Vince for some days to come. Another load of seat squabs from 51505 departed to be reupholstered. The Booking Hall received the usual quantity of telephone call, some of which were productive. Sign on 09.30 and then train prep. signing as alternately crew 1 or 2 on the roster. Well, we were shockingly wet all day and rather cold in parts as well. The first day of the 2012 operating season saw pleasing number of passengers, although possibly on a par with the amount of trainee guards on board too. A team spent most of the day shunting the shed in preparation for the 2nd Mk2f to go in for Pullmanising. Work continued on the bubble car in this area also. The conscript and his minder spent some time removing brash from the area around the south weighbridge. The LMSCA made a start on installing the floor into the Brake Third coach and nearby, work continued on the LMS brake van. The 8F group were in attendance. A solid start to the season. We were pleased to welcome the first 2012 Group Drive a Diesel Day today most ably hosted by Richard and Lewis. They had a day of activity that prepared us for next week with a great deal of most productive shunting that included moving the Pullman Buffet Car and removing vehicles from the Car Park siding. Delivery of logs to Shottle was also achieved. The participants in the Day enjoyed the fact that they were involved in our day to day activities. The furthest travelled was from Margate and benefited from the pure Derbyshire air. The Buffet Car project moved forward and the Booking Hall received visitors brought out by the pleasant unseasonable weather whilst continuing to paint poster boards. A group hug between myself, Passenger Services and Catering lead to the momentous decision to open the Pullman Buffet Car seven days a week from Monday 26th March. This will utilise our refurbished facility to its full potential acknowledging trade will take a while to grow. The base business opportunity in the week is already growing with Buyagift customers and charters that have been steadily emerging. The needs of our working volunteers will also be addressed with some attractive offers and tasty food that will challenge the offerings of Costa's Fish Bar. However, it also will become a destination for the good people of Wirksworth who appreciate good food and the ability to sample a genuine Derbyshire Cream Tea in our unique surroundings. Another most pleasant day of sunshine and warmer temperatures together with great productivity. The PWT changed a couple of sleepers in the Wash Green area and then turned their attentions to the Incline. Bob Swepstone's track recording machine had picked up a small area where the track was tight to gauge and a small section of line at the top of the line where the twist was unacceptable. These defects were remedied today and, again, some sleepers deemed to be life expired were changed. This represents a happy mix of new technology and good old fashioned solutions. Another branch of the PWT undertook a scheduled ground frame inspection and service which together with the crossing gate maintenance seems to ensure anything touched leaves a trace of grease behind. The VCT returned to the area south of Old Lane bridge and managed a three fire day together with patching up a large run of fencing in the area of milepost 1371/4. Anyone who observes the end product of all this work cannot but be impressed by how much improvement is being achieved. A great credit to all involved. The DTT are engaged in tiling the toilet block with John and Maurice making a fine job today. The skills of our teams never cease to amaze and the quality of work done will ensure everyone who uses this essential facility will gasp in amazement. The Pullman Buffet Car also reflects great credit on another John who is pulling this quite substantial project together. The vast change in our catering offer this year will pay great dividends and move our Railway up a gear. Yet another John is in go mode with the First Open even though it is still outdoors. The former branding has been removed and the areas filled and sanded down together the application of the first undercoat of Umber being applied to the west side. The Reverend's taxi has been employed as a white van as it transported seats from dmu 51505 to Ripley for re-upholstering. The joy of a black cab is that the doors are wide enough to take these seats to the upholsterer! A phone call announced the acquisition of a three lever ground frame from Tunstead which will be most welcome as this apparatus is becoming very rare. It may help the Shottle loop project if more hi-tec solutions do not materialise. The Booking Hall continued to receive group enquiries and the arrival of the big yellow machine in now on Plan B. It will be worth watching the webcam on Sunday morning - unless things change again.